Welcome to our list of the best workstations of 2019. These are the very best, most powerful, workstation machines that can power your business. These days, the best workstations are around the same size as normal PCs, and offer high quality designs, without sacrificing pure power and performance. Some, such as the iMac Pro and the Surface Studio, are slimline all-in-one PCs that offer brilliant performance whilst not taking up loads of room in your office. We've rounded up 10 of what we consider to be the best workstations currently on the market - in no particular order - from the main vendors. From small form factor models to powerhouses, from all-in-ones to one for all, there's bound to be one for you if you're in the market. At the bottom of this page you'll also find our list of the best online shops for buying workstations - so purchasing the perfect workstation for your business has never been easier! There are even a few amazing options that come in laptop form. Check out our best mobile workstations guide. Acer does a good line in workstations, and most of them are pretty affordable. The Acer Veriton X2640G SFF isn’t the most powerful of workstations, but it will do the trick if you need a dependable machine for most day-to-day tasks. There’s nothing particularly flashy about this workstation – but sometimes that’s just what you need. This excellent all-in-one workstation from Dell comes with an imposing 27-inch 4K Ultra HD touchscreen display, as well as a set of six speakers. That makes for the ideal workstation for photographers, video editors and music producers. The Dell XPS 27 performs admirably against industry-standard graphics-based benchmarks, no doubt thanks to the pacey 3.6GHz Intel Core i7-7700 processor under the casing. And this premium machine also gets premium peripheries in the form of a sleek and stylish wireless mouse and keyboard. An upgrade to the Mac Pro is imminent so you might want to hold on. But when it comes to the quintessential workstation, nothing comes near to this monolith. How Apple has been able to pack so much firepower into such a small volume almost defies the laws of physics. The current model, though, is well past its prime. It packs a 3-year old Intel Ivy-Bridge Xeon processor with up to 64GB DDR3 ECC RAM and 1TB storage (no RAID option though). Its two AMD FirePro D500 GPUs are likely to be the weakest link in the system, however, and even the top of the range model doesn't meet the minimum requirements to run the HTC Vive or Oculus Rift VR platform. It's also far more expensive than a comparable Windows-based workstation. The Apple iMac Pro is the most powerful PC that Apple has ever made, so if you love the design of Apple's devices, while using its software, then the iMac Pro is an excellent workstation. Its all-in-one form factor gives you plenty of space on your desk, but it is very expensive, which turn some people off. Microsoft has produced a brilliant all-in-one workstation that rival's Apple's iMacs for power and desirability. If you're wedded to the Windows 10 ecosystem, then this is a great alternative to the iMac Pro. Versatile and forward-thinking, Microsoft’s all-in-one puts the iMac to shame by introducing an all-in-one that can not only replace your lingering desktop tower, but your Cintiq as well. The Mac mini 2018 has finally been refreshed with modern hardware, bring Apple’s tiniest Mac into the modern age. This thing is filled to the brim with 8th-generation desktop processors, a ton of RAM and some of the fastest SSDs we’ve seen – all while keeping the same beloved form factor. OK, while it's not as powerful as the other workstations on this list, it has a few tricks up its sleeve which makes this worth considering. First, you can add an external graphics card to the Mac mini for added graphical prowess. You can also chain several Mac minis together and offload tasks onto each machine, making it an expandable – and incredibly versatile – workstation. 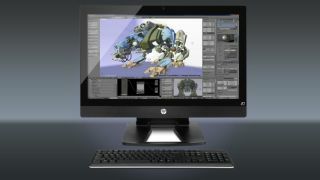 This is HP's entry level workstation and one which is very keenly priced with a very compact form factor (about 11L). It's hard to believe that the Z240 has an Intel Core i7-6700 CPU with 8GB of RAM and a 1TB hard disk drive. There's even an optical drive. The company's engineers have managed to deliver a system that weighs less than 6Kg and somehow has 20 (yes, 20) connectors and expansion slots (not all of them empty of course). It even has four DIMM slots to take full advantage of dual-channel technology. As for the rest of the HP workstation family, this one comes with the Remote Graphics Software as well as a three-year onsite warranty bundled. The only major compromise is the fact that it will only take low profile graphics cards. HP also offers the option to buy the workstation for as little as £16 per month excluding VAT. The small form factor market is attracting more manufacturers as they are vying to shed the bulky and wieldy image of the traditional workstation. Few, if any, however, can pride themselves on designing and manufacturing their products in the same area. Fujitsu can – take the J550. It can take a Xeon E3 CPU, a full-size professional graphics card, 64GB of RAM, offering up to 13.5TB storage and nearly 20 ports and expansion slots including quite a few legacy ones. Fujitsu is also the only company to offer a three-year warranty (either onsite or bring-in) across the EMEIA region, which spans across the whole of Europe, into Africa and stretches as far as India.